Make an exciting presentation with relevant information that captivates your audience. All of us have attended seminars, courses, conventions or any other type of event in which we have made presentations of projects, products and even ideas. These presentations have been boring, exciting, simply interesting or exciting. This makes that, when thinking about making a presentation, we have to make it different to reach our audience. Exciting or exciting presentations are the only ones we remember. In the case of boring presentations we immediately lose our attention, so we do not remember any of this at all. And there is nothing more frustrating than attending a presentation and getting bored, since not only is it a waste of time, but it is also a handicap for whoever does it, as it loses of our respect. In other words, we cannot afford to make a bad presentation, because we play with our reputation. Therefore, the presentations have to be interesting, exciting and effective. This means that we must handle presentation tools well, such as PowerPoint or Google slides templates. What is clear is that a good presentation is a very effective method to give information to an audience, in a direct way and emphasizing the points we want to convey. Keep in mind that getting the attention of the audience is key to convey well our message. We can achieve this in several ways, with our tone of voice, with the use of powerful images, with pauses, with questions to our audience and with our non-verbal communication. 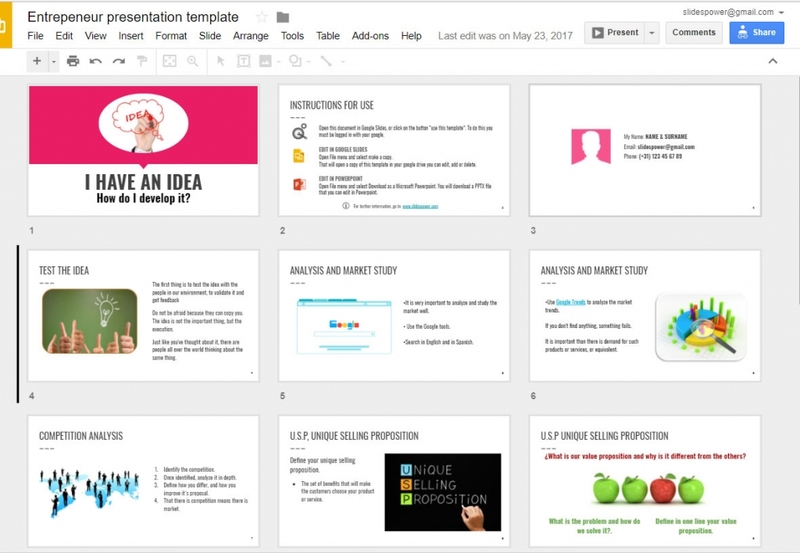 There are several tools to make presentations, but in the case of Google slides, it has a very important advantage over PowerPoint, and it is the possibility to share them with the audience, sending them the URL. Even our audience can ask questions or comments about the presentation live. Work on each of the slides independently, with key phrases and representative photos. Use professional photos and a good font, emphasizing with bold and underlined certain words that add strength to the message. There are millions of available fonts that can make your presentation exciting. You can use several fonts and cool colors to emphasize some points. Use the Guy Kawasaki rule 10-20-30 about the presentations that a presentation should not have more than 10 slides, last more than 20 minutes and be made in a letter of a minimum size of 30. Remember that people have short attention intervals and therefore it is good to refresh their memories by creating concrete and powerful slides to impact them, not reading ones. Once the presentation is finished and to extend the effect, send it by email, or upload it to your website or publish it as a podcast.